I'm trying to decide between the 2 Reds and 1 Blue color shown in the online configurator for F-Pace. Is the Dark Sapphire Blue the same as the one used by Jaguar in most adverts and at auto shows like the one shown below? Is this Dark Sapphire Blue? Does it have black pack? Does not look like it but the side vents are blacked out. Is this IRR? Or is this Odyssey Red? This is the config I want with black interiors. However, I feel the side chrome strip and the rear chrome diffuser look a bit odd. I want to retain the chrome strips at the front grills but want black strips for the side and rear. Looks like I will have to do a custom job post delivery as the black pack does it all black or none. I believe that's Caesium Blue which is only on the First Edition and I'm not sure if it's going to be available here; initially I thought it was but then it's not on the configurator. Not sure about the red, looks like IRR to me. But looking at the amber in the headlights it is US spec so I would guess the configurator just doesn't list the blue. Last edited by Bellanca_XF; 12-02-2015 at 02:23 PM. Interestingly, I dont find that blue listed on Jaguar UK site either. And I cant seem to find any First Editions in the UK site. Good point on amber in lights. If I recall correctly, the LA auto show had US spec vehicles on display. 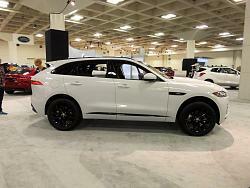 So Jaguar has been displaying vehicles in config that one cannot build! Time to reach out to Jaguar Concierge and see if they can provide any helpful information. 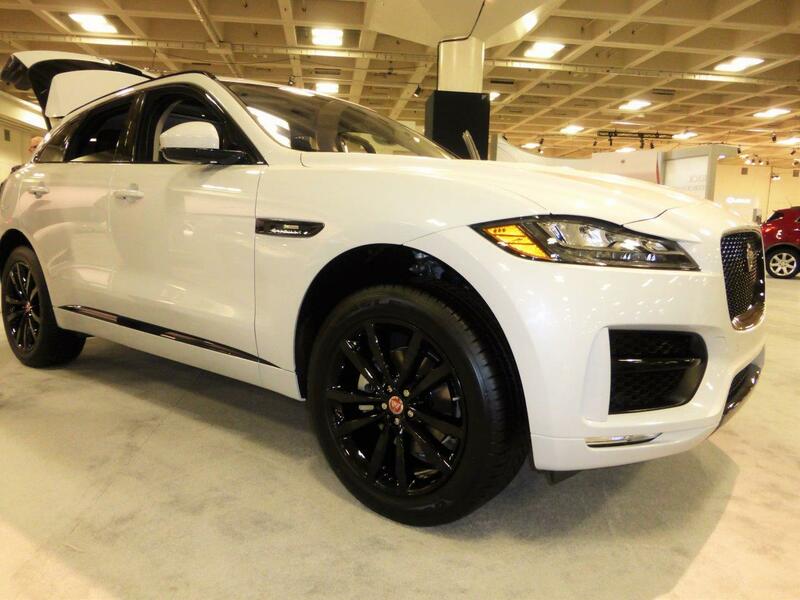 It was tough to take photos with the poor fluorescent lighting, but this is the F-Pace I saw at the San Francisco Auto Show a few weeks ago. I spent a lot of time looking it over and liked it a lot. I walked the show and kept coming back to it 4 more times. I listened to comments from people and they were all positive, except for the “tire-kicker” guy who asked “do these things still have electrical problems”, which I found comical. The neon-like interior lighting was cool and the much improved infotainment display was very nice. I am looking forward to driving the F-Pace and already asked my dealer to let me know when they have one available. 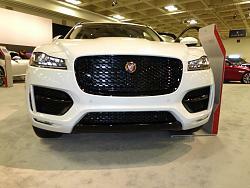 The Jaguar booth was packed with people and the F-Pace and XE were big hits in my opinion and the comments of others. It was tough to take photos with the poor fluorescent lighting, but this is the F-Pace I saw at the San Francisco Auto Show a few weeks ago. I wanted to attend one of these shows but was travelling. 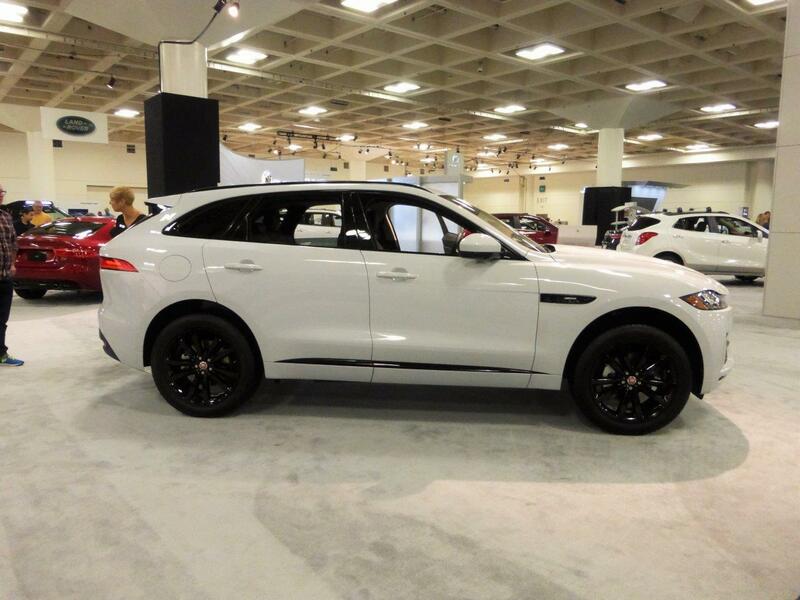 JLR has decided not to attend the Detriot show in Jan 2016. Not sure if there is some other auto show that would feature F-Pace in the near future. Amother thing that I'm confused about is that I was under the impression that Caesium Blue was only for the First Edition, which as I understand it comes with adaptive cruise control, but the F-Paces on display in this color didn't have the different emblem that is part of the ACC package. Caesium Blue is only for the First Edition. The standard equipment of the Fist Edition is not the same in all countries. Previsouly, First Edition was available on the UK configurator, it's not the case anymore... probably the 200 reserved for UK are already sold. Wouldn't it be a US spec car at the shows, though? You are right. 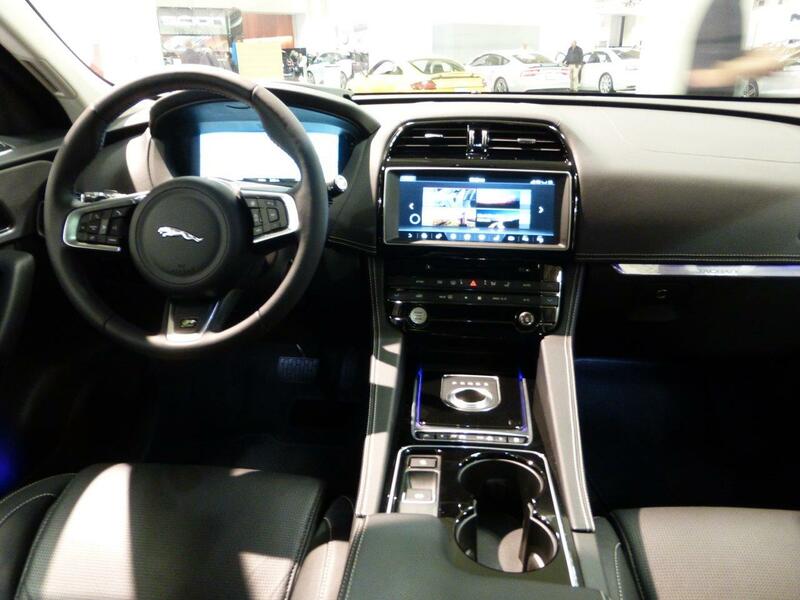 I found it on the Jaguar Australia website last night. I find it extremely odd that Jaguar would want to make colors exclusive across countries. I can fully understand reserving some colors for the FirstEditions to provide some exclusivity to the buyers. But making them mutually exclusive across countries is a bit much. No love from Jaguar for the States! Oh I know that, the only option left in it here is the Activity Key; my point was that with it having ACC standard I expected the model to have the little plastic rectangle around the emblem. So, I'm thinking maybe the list of standard equipment isn't right. 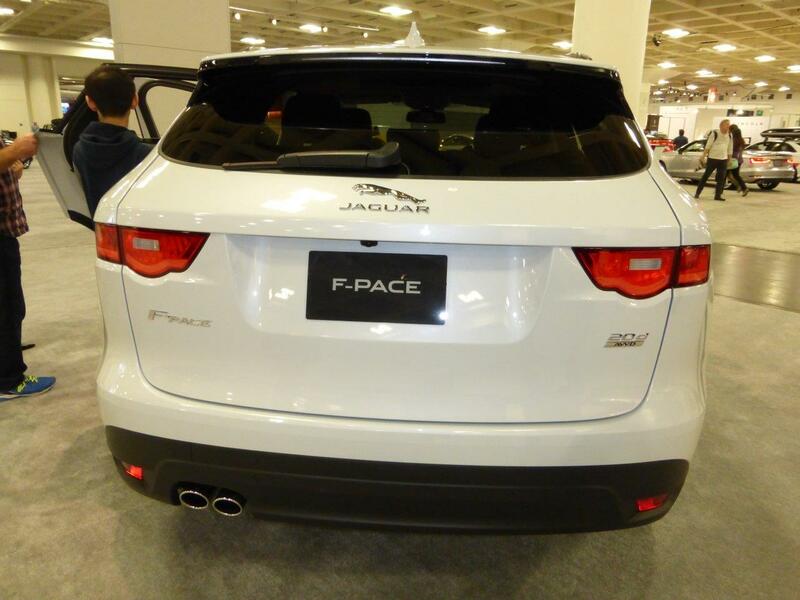 Or the F-pace shown is a 'expo' vehicule used in many countries and not the US version.... the one at Francfurt didnt have the ACC neither. Possibly, I was mainly basing it off of the amber in the headlights. I sent an email asking so I'll know soon enough. A Jaguar rep got back to me about some of my questions, in short they said they didn't know and for me to contact a dealership....umm, thanks for that. Thats the reply I got for most of my queries including one about JCNA discount. They told me to check with the dealer since they do not deal with queries about sales / ordering process. I have a good relationship with my dealer - will see if I can get any more information from him. I did get a flyer in the mail from the dealer today for the F-PACE and XE, hopefully that means they'd be able to answer my questions. I'll have to give them a call tomorrow; I hate when a rep doesn't know their product, they should be more knowledgeable. Which dealer in Ohio are you working with? My order was placed through Byers in Columbus as that is the closest one to me. They are great to work with, but don't seem to have a ton of inside knowledge on the F-Pace or XE at the moment. I seem to be bringing them info! The North American F-Pace brochure has been a great resource to check out options, colors, etc. Obviously not helpful in regards to discounts and other financial type info though. I'm right on the border with PA so it'll be with Bobby Rahal in Wexford. So I just got off of the phone with the dealership and the rep told me that he believes the First Edition will be available in Caesium Blue as well and that it will have ACC standard; excited about the blue but I don't want ACC; also, he told me they expect to have a demo model by the end of January. Front Turn Signals...On Front Or Side Of Bumper? Quick Reply: What colors were displayed at the auto shows?